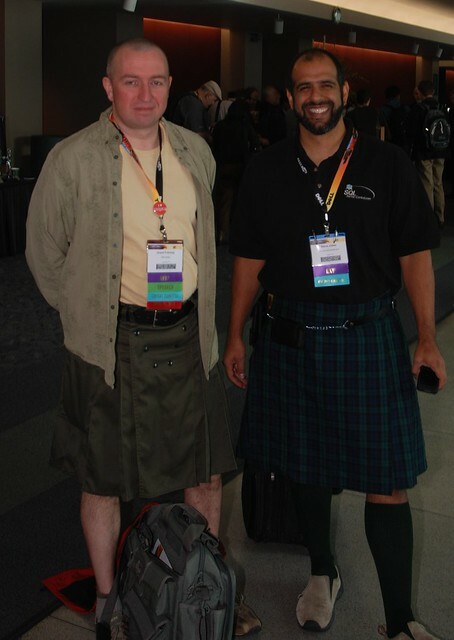 Last year, with the infinite power at my disposal (read, zero), I declared Wednesday, Kilt Wednesday at the PASS Summit. It took off… a little ways. Three people wore kilts. Now, you’d think that three out of 3000 would almost not get noticed, but the three people wearing them… well, each for different reasons, we stand out in a crowd. Heck, I was even told one of us looked good in the kilt (wasn’t me, of course). Anyway, where was I, oh yeah, we were noticed (and it might be because I jumped up on the bloggers table during one of the the key notes…) and now, this year, LOTS of people are planning on wearing kilts on Wednesday, November 10th, 2010. If you don’t have a kilt, don’t panic. You can always run down the street to Utilikilt, who has their headquarters right there in Seattle. There are lots of other sources. You don’t want to miss out, this year. It’s going to be fun. Follow the hashtag #sqlkilt on Twitter to keep up to date on what’s happening. Also, Wednesday is the Women In Technology lunch. So, you can get extremely creative and supportive WIT you should track down Jenn McCown (blog|twitter) and get one of her cool t-shirts. Shouldn’t there be pictures in this post???? I agree Kendra and we even have a picture of him in a kilt you can find it here. :) Grant is more than welcome to it of course. I didn’t include the pictures because I didn’t know where to find the one of Bill (? ), our 3rd kilt wearer and I didn’t want to leave anyone out. BTW, aren’t my legs lovely? I should probably avoid splitting wood for a week or two before the summit so I have a few less bruises & cuts. Bill is in that set as well as a matter of fact right here.